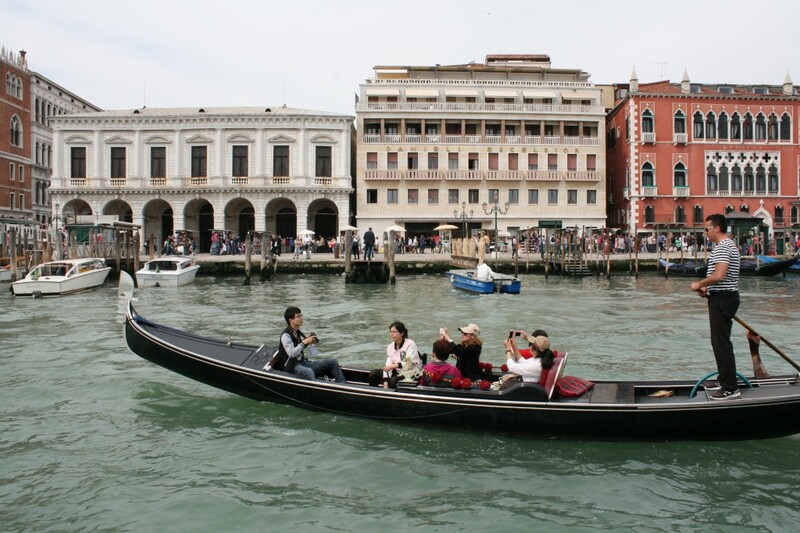 When you think of Venice, images of gondola, beautiful settings and romantic evenings come to mind. In every way, Venice is a perfect city to visit, located on a group of 118 islands, separated by canals and linked by bridges. The city has 120 churches and 420 bridges. We were fortunate in having Mario, as our gondolier. Trained and an experienced gondolier for 18 years, he was a walking encyclopedia, providing information on Venice and happily pointing out famous churches and other sites as we passed them during our tour. There’s even a gondolier school offering 1.5 hour gondola training for the adventurous ones, but I politely declined Mario’s suggestion to join. Renowned for its beauty and architecture and artworks, Venice is declared a World Heritage Site not only in its entirety, but also along with its lagoon. The main public square of Venice, Piazza San Marco, is worth a visit. Napoleon described it as “the drawing room of Europe” because it forms the social, religious and political centre of Venice. It is here that, one would visit St. Mark’s Basillica in St. Mark’s Square. For a first time visitor, it was recommended we take a two-hour walking tour. We were glad we did as it is here that we discovered the ‘real Venice’ by entering narrow passageways and alleys. Other famous highlights included Santa Maria Formosa, Marco Polo’s House and Rialto Bridge. The main street of Venice is the Grand Canal. One can hop aboard a gondola and see the impressive palazzo, residences of wealthy families with their colourful exteriors. It is quite an experience to visit Venice, still a city without cars and observe everything that the city needs transported by water or handcart. We stood on top of a bridge and enjoyed seeing boats filled with fruit, vegetables, soft drinks and building materials transported by boats. An unusual experience for us was taking a water taxi from the airport to our destination hotel. The water taxi took six passengers but anything other than one suitcase per person was charged extra. Our driver, obviously eager to return for more passengers, drove like a maniac, forcing the group to hold on to something strong for balance. The water taxi passed through open sea and later going through winding canals. To reach our Bisanzio Best Western Hotel in Calle Della Pieta, Venice Island, was something else. Unknown to us, we had to carry our own luggage, climbing huge steps of four bridges for at least four blocks. One of the passersbys even took pity on us and helped us in climbing steps with the luggage. On the return journey, we were smart and hired a porter who came with his trolley equipped to climb steps. If you are planning a trip or a cruise of the Mediterranean destinations such as Greece, Italy, Spain, France and Monte Carlo, think again unless you are willing to do a lot of walking and climbing steps to see museums, monuments and historic sites. These are not countries to visit for those who are not good walkers or those with mobility problems. Most Greek, French and Italian ancient monuments involve lots of walking and climbing several steps to enjoy the wealth of historical knowledge that they offer. Some cruise lines warn passengers ahead of time about this by e-mailing a list of excursions indicating the ones requiring simple to aggressive walking. Islands in the Mediterranean Sea are tranquil and beautiful, inhabited by friendly people, who are very conscious of the revenue that ships bring to their communities. They are eager to help even if you don’t enter their store to buy. If you get lost or want to ask for directions to a particular tourist attraction, any passerby or shopkeeper will oblige with a smile.